Today is International Bat Appreciation Day! Bats get a bad wrap from homeowners but they’re actually very useful pollinators and insect eaters. They are especially efficient at killing mosquitoes. If you’ve noticed these small flying mammals flying around your yard at night, you might have wondered how to make your yard and landscape more bat-friendly. There are several ways to do so that are easy and inexpensive. Landscape contractors can also suggest these to clients as well. Bats enjoy roosting in enclosed spaces during the day. You can build a bat house or alternatively, let dead and hollow trees stand. Just make sure these trees won’t create a hazard. The trees can also act as a place for insects to live which will, in turn, create a food source for the bats. Creating a diverse landscape of different plants will also attract insects that will feed bats. Bats will assist in pollinating these plants. Bats will also need a water source. The water will attract birds to your yard as well. The water source should be a fairly wide pond or stream because bats need room to swoop down when they drink. Chlorine can hurt bats so refrain from thinking your pool could be a sufficient water supply. You’ll want to keep artificial lighting to a minimum as well. Too much of it can affect the bat’s sense of time of when to fly and when to roost for the day. 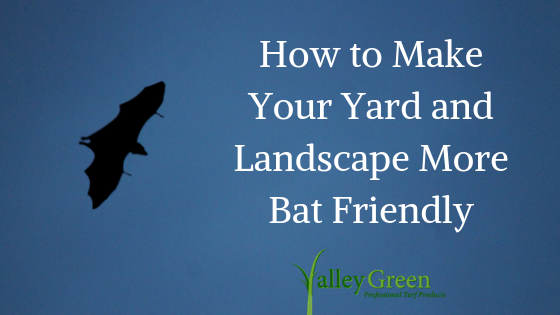 If you want to keep some lighting for security, dimmers and light hoods can provide a good way to feel safe but not affect your yard’s bat population. Bats also prefer lots of cover even when flying at night. Trees and denser shrubs can provide them with a place to take refuge from their predators which are mainly owls and snakes. Planting native trees can offer this protection and they are often hardier and easy to grow. You’ll also want to refrain from hanging anything that makes excessive noise as bats are often frightened by loud noises.